Today digital meters are replacing analog meters in every sector whether its electricity meter or taxi fare meter. The main reason for that is analog meters have mechanical parts that tend to wear when used for long time and they are not as accurate as digital Meters. A good example for this is analog speedometer and odometer that is used in old motor bikes for measuring speed and distance travelled. They have a special parts called pinion and rack arrangement in which a cable is used to rotate speedometer’s pin when wheel is rotated. This will wear out when using for long period and also needs replacement and maintenance. Today, in this tutorial we will make a prototype of a Digital Taxi Fare Meter using Arduino. 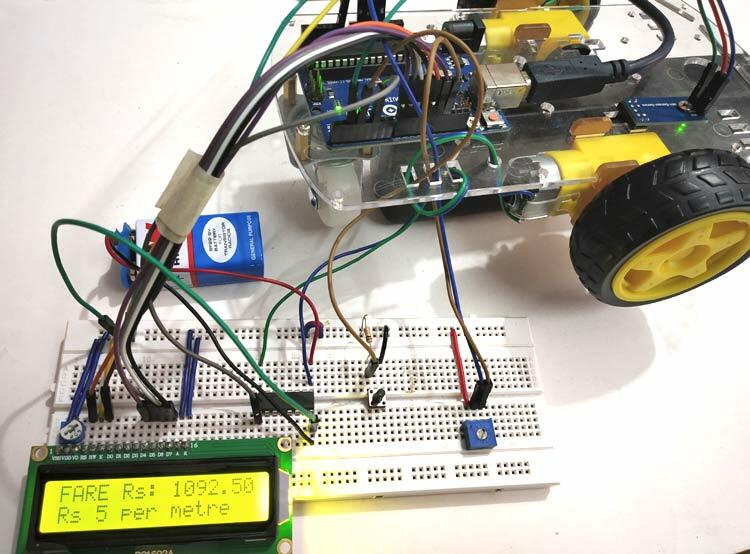 This project calculates speed and distance travelled by the taxi’s wheel and continuously displays it on 16x2 LCD display. And based on distance travelled it generates fare amount when we press push button. This prototype has a RC car chassis with a Speed sensor module and an encoder wheel attached to motor. Once speed is measured, we can measure the distance travelled and find the fare amount value by pressing push button. We can set the speed of the wheel using potentiometer. To learn more about using LM-393 Speed Sensor module with Arduino, follow the link. Let’s see a short introduction of Speed sensor module. This is a slot type module that can be used for measuring speed of rotation of encoder wheels. This Speed sensor module works based on slot type optical interrupter also known as optical source sensor. This module requires a voltage of 3.3V to 5V and produces digital output. So it can be interfaced with any microcontroller. The Infrared Light sensor consists consists of light source (IR-LED) and a phototransistor sensor. Both are placed with a small gap in-between them. When an object is placed in between the gap of IR LED and phototransistor it will interrupt the light beam causing phototransistor to stop passing current. Thus with this sensor a slotted disc (Encoder Wheel) is used that can be attached to a motor and when the wheel rotates with motor it interrupts the light beam between IR LED and phototransistor that makes output On and Off (Creating Pulses). Thus it produces HIGH output when there is interrupt between source and sensor (When any object is placed in between) and produces LOW output when there is no object placed. In the module we have an LED to indicated the optical interrupt caused. This module comes with LM393 Comparator IC which is used to produce accurate HIGH and LOW signals at the OUTPUT. Thus this module is sometimes called as LM393 Speed sensor. To measure the speed of rotation we need to know the number of slots present in encoder wheel. I have an encoder wheel with 20 slots in it. When they rotate one complete rotation we have 20 pulses at the output. So to calculate speed we need number of pulses produced per second. For calculating speed in RPM (Revolutions per Minute) multiply with 60. Measuring distance travelled by the wheel is so simple. Before calculating distance, the circumference of the wheel should be known. Where d is the diameter of the wheel. Value of π is 3.14. I have a wheel (RC car wheel) of diameter 6.60 cm so the circumference is (20.7 cm). So to calculate the distance travelled, just multiply the no of pulses detected with the circumference. In order to calculate the distance in meter divide the distance in cm value by 100. Note: This is a small RC car wheel, in real time cars have bigger wheels than this. So I’m assuming that circumference of the wheel to be 230cm in this tutorial. To get the total fare amount, multiply the distance travelled with the fare rate (amount/meter). Note: In this tutorial I’m assuming that Rs 5 is charged per meter. So if the wheel is travelled 20m then fare amount will be 20*5=100 rupees. So now let’s get the components and build the circuit. Learn more about interfacing LCD with Arduino here. I have used a 9V battery and ULN2003 IC to externally power the motor. A push button with pull down resistor is connected to the pin 3 of Arduino for generating fare amount when pressed. A potentiometer is used to give analog input voltage to the pin A0 of the Arduino for varying speed of the motor wheel. Complete code with a demonstration Video is given at the end of this tutorial. Here we understand few important parts of the code. Before getting into the code we need to know about interrupts and timer One library as they are used in the code. Interrupts is used here because we need to constantly check the output detected at the speed sensor module as the high priority. So ISR is used in the code. ISR is interrupt service routine that is called when an interrupt is occurred at the interrupt pins 2 & 3. Arduino UNO has two interrupt pins 2 and 3. At pin 2, output from D0 of speed sensor is connected. At pin 3, a push button with pulldown resistor is connected. 1. First of all, include libraries for the functions are going to be used in programme. 2. Next declare the global variables as they will be used throughout the program. 3. Next define and initialize the LCD pins that are connected to Arduino. Define the pin mode, here PIN A0 is used for taking Analog input from potentiometer and pin 5 to write analog output which is connected to IN1 pin of ULN2003 IC. Next display some welcome message and clear them. Next attach two external interrupts. First interrupt makes the Arduino pin 2 as interrupt pin and calls ISR (count) when there is RISING (LOW TO HIGH) detected at the pin 2. This pin 2 is connected to the D0 output of the speed sensor module. And second one makes the Arduino pin 3 as interrupt pin and calls ISR (generatefare) when HIGH is detected at the pin3. This pin is connected to the push button with a pull down resistor. ISR1- count() ISR is called when an RISING (LOW TO HIGH) is happened at the pin 2 (connected to speed sensor). ISR2- timerIsr() ISR is called every one second and execute those lines present inside the ISR. This function contains the lines that actually first detach the Timer1 and Interrupt pin2 first because we have LCD print statements inside the ISR. For calculating SPEED in RPM we use below code where 20.0 is the no of slots preset in the encoder wheel. Next read the analog pin A0 and convert it into digital value (0 to 1023) and further map those values to 0-255 for PWM output (Setting speed of motor) and finally write those PWM values using analogWrite function that is connected to the ULN2003 Motor IC. ISR3: generatefare() ISR is used to generate the fare amount based on the distance travelled. This ISR is called when interrupt pin 3 is detected HIGH (When push button pressed). This function detaches the interrupt at pin 2 and the timer interrupt and then clears the LCD. After that distance travelled is multiplied with 5 (I have used 5 for the rate INR 5/meter). You can change according to your wish. After calculating the amount value display it on the LCD display connected to Arduino. You can further improve this prototype by increasing accuracy, robustness and adding more features like android app, digital payment etc and develop it as a product. attachInterrupt(digitalPinToInterrupt(2), count, RISING); // Pin 2 as Interrupt pin with count ISR is called when LOW to RIGH happens. attachInterrupt(digitalPinToInterrupt(3), generatefare, HIGH); //Pin 3 as Interrupt pin with generatefare ISR is called when HIGH is detected. Hey Scott, LCD with I2C pinout can be easily interfaced with Arduino. Infact it is easier to connect them to Arduino than the converntional methond.